I had the privilege of spending this past weekend exploring Leon, a city full of University students, churches and a rich history dating back to the colonial times. 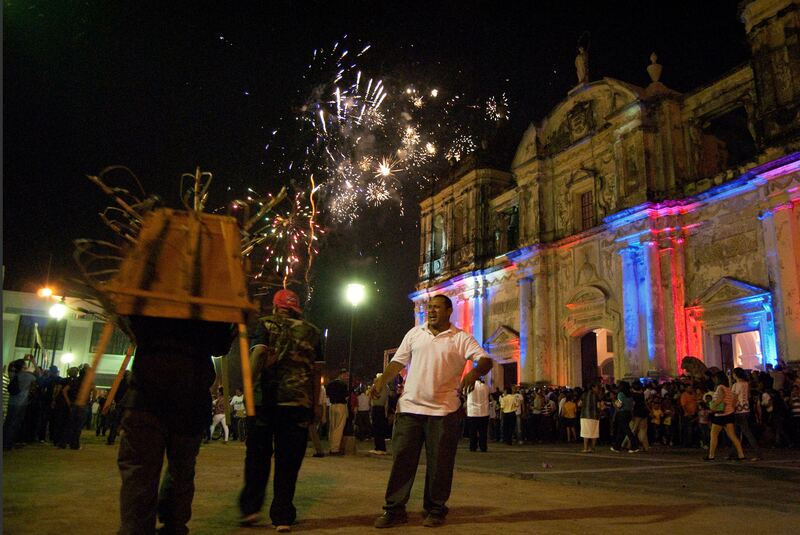 I also arrived just in time to celebrate a widely known tradition of Leon, La Purisima. This is a time when Catholics honor the immaculate conception of Virgin Mary. La Purisima is celebrated from November 28th to December 8th, but the biggest event, La Griteria, is celebrated on December 7th. For those of you not familiar with this tradition you can read previous blog entries here or here. Besides having experienced Purisima in Managua, Leon is a whole different story. Hundreds of people gather in the plaza downtown in front of the grand Cathedral of Leon at 6:00pm sharp for the official start to the celebrations. Sirens begin to wail and fireworks start going off all over the city. Many people (both children and adults) spend the evening visiting houses who have put up an altar of the Virgin Mary. But instead of singing in an orderly fashion like in Managua, in Leon the people only yell “Quien causa tanta alegria?! ?” and those in the house respond “La concepcion de Maria!” and hand out candy and other small gifts to the crowd who are reaching their hands in and pushing and shoving each other to grab their gift before running on to the next house. Complete chaos mixed with complete joy and excitement. “La Gigantona” is a dance that, similar to other traditional folkloric dances, makes fun of the Spanish people who came during the period of colonization. “La Gigantona” is like a giant doll made out of a wood frame wearing a long colorful dress with lots of decorations. She represents the typical tall, light-skinned, rich Spanish woman. Normally dancing with her is “El Enano Cabezon” (the big-headed dwarf), which is usually a kid wearing the frame of a large head which goes down to their waste and at their waste is attached the frame of shoulders wearing a suit. The effect when they swing their hips looks like the shoulders of the little man swing back and forth. “El Enano Cabezon” is supposed to depict the indigenous man who is short, dark-skinned and poor yet very intelligent (hence the big head). “La Gigantona” and “El Anano Cabezon” are always accompanied by a drummer who plays as the dancers in costume swing side to side, causing their arms to flail back and forth. You often see “La Gigantona” dance at celebrations such as these, but also you will see kids in the streets performing this dance to try to earn some money. Similar to “La Gigantona” there is also the more famous dance of “El Gueguense” which also makes fun of and protests the Spanish colonization. In Leon I also had the chance to visit The Museum of Legends and Traditions (also known as “The Prison 21” because of it’s history as a torture prison used by the dictator Somoza that opened in 1921). Besides learning about the history of the prison, there are also some interesting depictions of various legends and traditions in Nicaragua (I highly recommend going if you’re in Leon). One of my favorites is “La Chanca Bruja” (The Pig Witch). This legend originates from the story of a heartbroken women, who out of hate for men who had been unfaithful to her made a pact with the devil so she could turn into a pig. Supposedly this black pig would pursue and attack men who had been unfaithful and they would wake up without recollection of what happened, only with bruises and empty wallets. Another is “La Llorona” (The Crying Woman), who supposedly fell in love with a Spainaird despite the warnings of her mother not to. When she became pregnant the Spanaird left her. When it finally came time to have her baby she went down by the river. After the baby is in her arms she had so much regret and rage that she began choking the baby, when she realizes what she is doing and wants to keep the baby it’s already too late and she must throw the baby into the river. The grief makes her go crazy and she spends the rest of her life wandering the streets crying and asking for her baby. Eventually she dies of sadness, but supposedly her ghost still comes and haunts children who go to the river alone without their parent’s supervision. It’s fun to laugh at some of these traditions and legends, but I admire that they tell real (or imaginary) stories in creative ways in order to keep history alive or teach a lesson. Yet it’s also interesting to question if these stories are just a fun cultural tradition or if they still have significance today. And if they do, how do we analyze the different roles of gender, race and class that we see portrayed in these stories? In the end I enjoyed my cultural experience in Leon. Sadly I wish I had more pictures to share, but my camera was stolen in the excitement and crowds of Purisima. An incident that reminds me, especially as a targeted rich white foreigner (and rightly so), not to get too attached to material possessions. And to remember that although extreme poverty and robberies are a sad reality that is heightened during the Christmas season, there are also many generous people and life-giving traditions that go on during this holiday season as well. This entry was posted in Uncategorized and tagged gigantona, la chanca bruja, la llorona, legends, leon, Nicaragua, Purisima, traditions by bataholavolunteers. Bookmark the permalink.